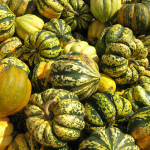 Cut each squash lengthwise in half and scoop out the seeds. Cut each half into 3 crescent wedges and then arrange all 12 wedges in a roasting pan or baking dish just large enough to contain them in a single layer. Drizzle the olive oil evenly over the squash wedges and season them with salt and pepper to taste. Scatter some of the crumbled blue cheese and slivered sage into the hollow of each wedge. Roast the acorn squash until the edges of the wedges are caramelized, the flesh is tender, and the blue cheese is very melted, 50 minutes to 1 hour. Serve the acorn squash hot.